In my last post, I shared how focusing attention can physically reshape the connections in our brains, facilitating change. The brain's tendency to hardwire circuits supporting common or repetitive tasks makes it difficult to change those actions. The challenge, of course, is multiplied when you're dealing with multiple brains within an organization. Cultivate moments of insight. Researchers have found that "large-scale behavior change requires a large scale change in mental maps." This, in turn, requires some kind of event or experience through which people change their attitudes or expectations more quickly and dramatically than usual. It's the "aha" moment when a fresh insight comes into view. This is the starting point for a reconfiguration of the brain's mental maps. Brain imaging has revealed sudden bursts of high-frequency oscillations just prior to moments of insight. Turns out that the metaphor of a light bulb turning on is not so far from reality. These oscillations are conducive to the formation of new links across several parts of the brain. In a moment of insight, then, new connections are being created. This is key to overcoming the brain's hardwired resistance to change. So in practical terms, how do you cultivate moments of insight? An important conclusion from the research is that insight comes more from self-discovery than by advice-giving. This runs counter to the common approach of setting change in motion by giving directions or training through one-way instruction. Instead, Schwartz and Rock advise asking questions rather than just telling people what to do or think. The ancient Socratic method of teaching still has value. Careful use of questioning can guide people to discovering the insights they need to change. Thus they are more likely to take ownership of the new way of doing things. Promote active reflection. Schwartz and Rock suggest that the cognitive transformation that leads to new behaviors follows a predictable path: (1) awareness, (2) reflection, (3) insight, (4) action—what they call the ARIA model. Awareness is focusing attention. Reflection involves shifting our perspective. Insight comes when we can see the situation differently. Acting on that insight further enables new brain connections to form. Reflection doesn't imply idle "navel gazing." But it does involve reducing the usual noise and distraction to allow for focused evaluation of the issue at hand. Block out periods of uninterrupted time for your team to reflect on strategy and change. Once again, you are encouraged to use questions to guide the reflective process. Orient the questions toward evaluating opportunities, possibilities, and practical solutions. Focus on solutions rather than problems. Managers too often concentrate attention on which old behaviors need to be changed rather than what new behaviors need to be added. 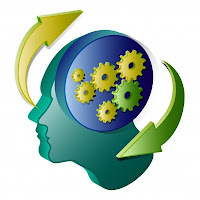 Remember, focusing the brain on new connections is what leads to new hardwired behaviors. Giving attention to old behaviors, on the other hand, is more likely to draw out feelings of anxiety or defensiveness, which will inhibit change. Positive reinforcement is immensely valuable in shaping new dominant pathways in the brain. A favorable consequence increases the frequency of new behaviors, which helps the brain prune old connections and create new ones. Negative reinforcement, by contrast, may increase compliance, but it impedes the cognitive change process. The best way to overcome entrenched behaviors is to supplant them with new ones. So focus on solutions rather than problems, new behaviors rather than old ones. Increase relevant communication. Attention density is a term that describes "the amount of attention paid to a particular mental experience over a specific time." Leaders can increase attention density by keeping new practices and concepts top of mind. How? In large part, by simply talking about them on an ongoing basis. Much of what I've read about organizational culture change stresses the importance of frequent, focused communication. Our conversations tend to reflect what matters most to us. Listen to what people talk about in an organization for a few days and you'll have a good idea what their culture is like. If you want to change that culture—and there's a strong correlation between behavior change and culture—then you want to increase the conversation around the desired change. I touched on feedback earlier, but it's worth mentioning again because it's a powerful form of communication relative to changing behaviors. Coaching is one particularly effective method of providing feedback. It's impact is well documented. In one study, for example, a training program alone increased productivity 28%, but following up the training with related coaching increased productivity by 88%. How? By increasing the attention density that promotes the rewiring of brains for the new tasks. For all the struggle most of us have endured in trying to accomplish organizational change, these steps may seem like an oversimplification. Schwartz and Rock anticipated that reaction: "Perhaps you are thinking, 'This all sounds too easy. Is the answer to all the challenges of change just to focus people on the solutions instead of problems, let them come to their own answers, and keep them focused on their own insights?' Apparently, that's what the brain wants." Hopefully this post has you contemplating how you can better incorporate these amazing insights about the brain into how you lead others. With a little thought and practice, it may well make the job easier—not to mention more successful.